Peru is known for having the most interesting and delicious food in all of South America, and Lima is its gastronomic capital. Although Lima's Cuisine draws from its Andean heritage, it is to a large degree an amalgam of the cooking practices and dishes brought here by the Spanish, and by the waves of immigrants from Africa, Italy, China, and Japan who adapted to using Peruvian ingredients in the recipes and cooking methods from their homelands because there was nothing else available. In addition to the international influences, there has been a strong internal flow of Peruvians relocating from rural areas to Lima since the second half of the 20th century, that has had significant influence on Lima's cuisine. Creole cuisine is the most widespread in this cosmopolitan city. The only major international cuisines with a large presence are Chinese (known locally as chifa) and Italian. These, however, have been heavily modified due to a shortage or lack of authentic ingredients. The city's bakeries are quite popular with Peruvians. One may find Peruvians standing in line in almost every bakery waiting for freshly baked white bread from 6 to 9 am and from 4 to 6 pm. The majority of Peruvians tend to eat bread for breakfast along with coffee or tea. Almost all bread in Peru, with the exception of baguettes, is white bread fortified with lard, butter or other shoertning. Whole wheat bread is mostly imported from Europe and sold at upscale grocery stores. A few coastal cities bakeries produce "bollos," which are loaves of bread baked in stone and wood-ovens from the Andes. Anticuchos, are brochettes made from a beef heart marinated in various Peruvian spices and grilled, typically served with boiled potatoes and corn. They are commonly sold by street vendors and served shish kabob-style, but one may find them in creole food restaurants. Also frequently sold by street vendors are tamales: boiled corn with meat or cheese and wrapped in a banana leaf. They are similar to humitas, which consist of corn mixed with spices, sugar, onions, filled with pork and olives and finally wrapped in the leaves of corn husks. Tamales are a common breakfast food, often served with lima and/or "Salsa Criolla." Ceviche, often spelled "cebiche" in Peru, is the flagship dish of coastal cuisine, and one of the most popular dish among Peruvians. It consists of Andean chili peppers, onions and acidic aromatic lime, a variety brought by the Spaniards. A spicy dish, it consists generally of bite-size pieces of white fish (such as corvina or white sea bass), marinated raw in lime juice mixed with chilis. Ceviche is served with raw onions, boiled sweet potatoes (camote), toasted corn (cancha), and sometimes a local green seaweed yuyo. Leche de tigre (tiger's milk), is the Peruvian colloquial name for the juice produced from the ingredients of ceviche. It has a light spicy flavor. Many Peruvians believe that ceviche is a hangover cure and an aphrodisiac. Unlike ceviche from Mexico and Ecuador, it does not have tomatoes, and unlike that of Tahiti it does not use coconut milk, though both are abundant in Peru. A variation available in Callao replaces mango for fish. Tacu-tacu: Mixture of beans and rice, fried, and topped with breaded and pan-fried steak and an onion salsa.Papa rellena (stuffed potato): mashed potatoes stuffed with ground (minced) meat, eggs, olives and various spices and then deep fried. Arroz tapado (covered rice): uses the same stuffing of papa rellena, but rather than used as a stuffing, it is accompanied by rice. Sancochado is a hearty beef and vegetable broth that includes yuca (cassava) and potatoes. A local staple found in many cheaper, as well as more up-market, restaurants is lomo saltado, sliced beef (if made from the tenderloin it is "lomo fino") stir fried with onion, tomato, soy sauce, vinegar, chili (aji) and served or mixed with French fried potatoes (aka "chips"), and accompanied with rice. Arroz Chaufa or Chinese style rice is one of the frequently sampled dishes that has found its way into Peruvian cuisine. Arroz con pollo, or rice with chicken, is enjoyed for its rich-flavored rice combined with chicken. Chupe de pescado or fish cioppino is popular in Lima and along the coast. Lima butter bean (pallares) salad is a salad made with Lima butter beans (called pallares in Perú), cooked (but still whole) and mixed (when cooled) with a mixture of onions, slices of tomatoes, and green ají (chili), marinated in green Peruvian lime juice, oil, salt, and vinegar. Lima butter beans (pallares) have been part of the Peruvian cuisine for at least 6,000 years. Butifarras is a sandwich with "Peruvian ham", sliced onions, sliced chili peppers, lime, salt, pepper, oil, in a type of white bread roll. Causa, in its basic form, is a mashed yellow potato dumpling mixed with key lime, onion, chili and oil. Varieties can have avocado, chicken, tuna (typically canned) or even shellfish added to the mixture. Also, causa is popular in Lima, where it is distinguished by the name Causa Limeña. Causa is usually served cold with hard boiled eggs and olives. Carapulcra is an appetizing stewed dish of pork and chicken, dried potatoes, red chilis, peanuts and cumin. 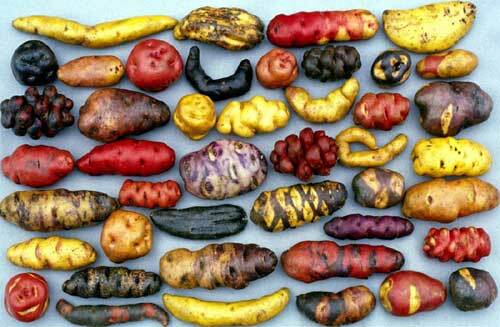 The version from the Afro-Peruvian Ica region uses fresh potatoes. Empanadas (meat turnovers) were introduced by the Spanish during the colonial period, and later modified, possibly due to lack of Spanish ingredients (olive oil, codfish, smoked paprika, etc.). In Peru, they are filled either with chicken, beef, or cheese. Olives, and sometimes hard boiled eggs and raisins gives them a unique taste. Ají de gallina (chili chicken) consists of thin strips of chicken served with a creamy yellow and spicy sauce, made with ají amarillo (yellow chilis), cheese, milk, bread. Occasionally walnuts are added on special occasions or at upscale restaurants due to its prohibitive cost in Peru. Traditionally the meat is from non-laying hens, but today almost exclusively made from more tender chickens. Escabeche criollo (pickled fish): "Escabeche" when the word is used alone normally refers to fish escabeche. Other varieties can use duck or chicken. The escabeche dishes rely in the cooking on the heavy use of vinegar and onions together with other spices and chili. Cau cau is a meal consisting of mondongo or tripe stew and accompanied by rice. There are a number of versions of Cau-Cau. In general cau-cau is a style of cooking being there seafood cau-cau, shellfish cau-cau, etc. Two noteworthy styles are the creole style simply called Tripe Cau-Cau, and the Italo-Peruvian style. The creole is made with strips of previously cooked tripe, seasoned by a mixture of sauteed onions, garlic, yellow aji, a pinch of turmeric, salt and pepper and chunks of boiled potatoes. The mixed is allowed to cook together to blend the tastes and acquire consistency. It is then sprinkled with spearmint or mint. The other common version is the "Italian" style. It consists of strips of precooked tripe sauteed with a mixture of red onions, peeled tomatoes, tomato paste and dried mushrooms (Porcini). After the flavors blend it is seasoned with parsley and mixed with fried potato strips just prior to serving. Some chefs add a few tablespoons of wine or pisco following the sautee step. These recipes may have African and Chinese influence as well as Italian. Chicharrones is salted pork deep-fried in its own fat. There are at least two kinds of chicharrones: pork skins, and country style ribs that are first boiled, then rendered in their own fat until they brown into chicharrones. Other types of chicharrones including deep fried squid, and other seafoods. They can be served at breakfast, or any time of day.